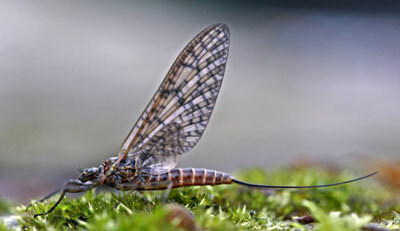 "For anglers, the March brown Rhithrogena germanica is one of the most iconic mayflies. Although the species is in decline and under threat across Europe, the UK may be a stronghold. The adult can be distinguished from all other similar mayflies by their early flight, mottled wings and dark spot on each leg. 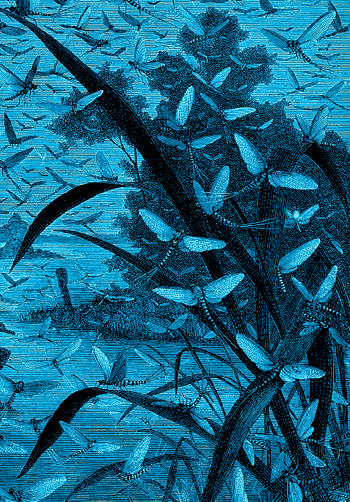 The nymphs live in rivers and streams, hatching into adults in large numbers between late March and the end of April. This hatch occurs often around mid-day and typically lasts for a very short period. The over-winter development and early flight period of the March brown make it particularly vulnerable to environmental changes in these critical periods. We need to find out where this species occurs in the UK so that we can help protect it. or use the attached postcard. Hard copies are available on request, please reply with your address and the number of copies that you would like to receive. There are already records coming in from a number of locations, including what seems to be the first record of the March brown from Cornwall. Remember that all your records are valuable, no matter where they come from. See the Riverfly Partnership website for information about the survey." The Teifi Rivers Invertebrate Monitors (TRIM) are a group of volunteers who sample the invertebrate life in the River Teifi and its tributaries on a regular basis at defined collection points. The group is part of the Teifi Rivers Trust Fly Life Monitoring Project. TRIM volunteers have been trained in the Riverfly Partnership method of invertebrate identification and collection. Invertebrate samples are taken from the river and examined, categorised and recorded. The data is then submitted to the Environment Agency. By establishing a record of the types and numbers of the aquatic invertebrates in our rivers changes in their abundance and diversity can be measured enabling conclusions to be made about the health of the water. Aquatic invertebrates are the staple food items for juvenile and mature fish and a significant part of the diet of bats and birds such as dippers and wagtails. When the abundance of aquatic invertebrates decline there is a corresponding decline in the number of fish which in turn affects populations of otters, kingfishers and herons to name just a few of the animals which we admire and associate with rivers. It is our aim to learn more about these vitally important invertebrates and to share this knowledge for the good of the rivers which join to make the River Teifi. The TRIM sampling equipment and training was jointly funded by the Countryside Council for Wales, the Environment Agency Wales, Teifi Rivers Trust, Teifi Trout Association, Llandysul Angling Association and Tregaron Angling Association.